Showing items in category Lagos, sorted by newest listed first. LAGOS - 1906 1d rate postcard use to UK used at IBADAN. 1906 (NO.9.) 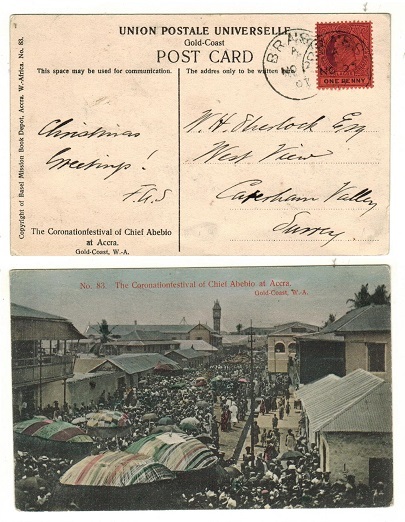 postcard use to UK depicting 'Catholics In Lagos' bearing 1d (SG 55) tied by s/r IBADAN cds. 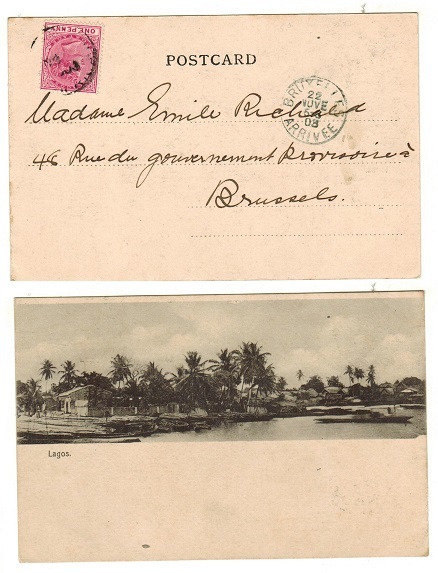 LAGOS - 1906 1d rate postcard use to Germany used at WARRI. 1906 (DE.7.) 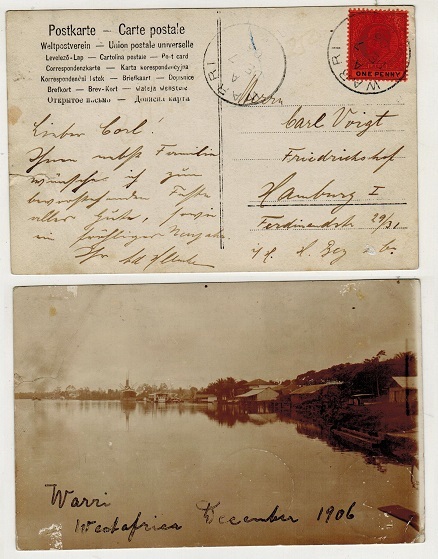 postcard use to Germany depicting a real photograph water side scene of 'Warri' bearing 1d (SG 55) tied by s/r WARRI cds. LAGOS - 1907 1d rate postcard use to UK used at BRASS. 1907 (NO.2.) 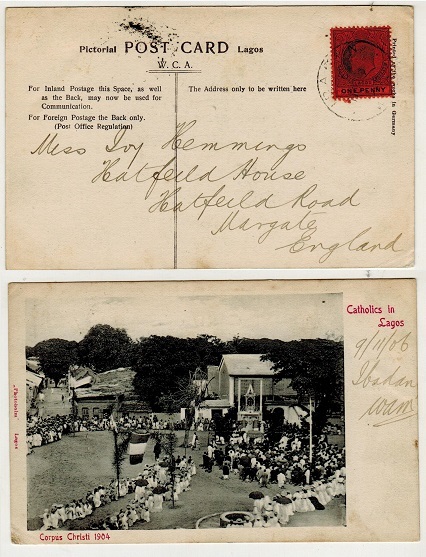 use of picture postcard addressed to UK depicting 'The Coronation Festival Of Chief Abebio at Accra-Gold Coast' bearing 1d adhesive tied by s/r BRASS cds. 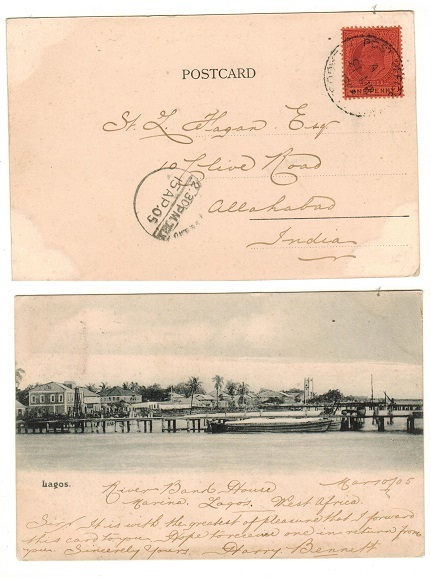 LAGOS - 1907 1d rate postcard use to Barbados (scarce) used at ONITSHA. 1907 (JU.27.) 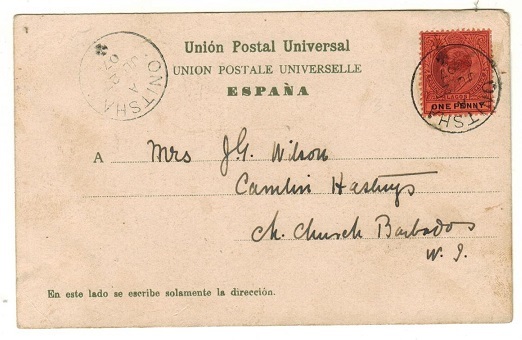 use of picture postcard addressed to Barbados (scarce) depicting 'Las Palmas' bearing 1d adhesive tied by s/r ONITSHA cds with additional strike at left. LAGOS - 1904 'Lagos/Southern Nigeria' combination postcard use to UK. 1904 (MY.12.) 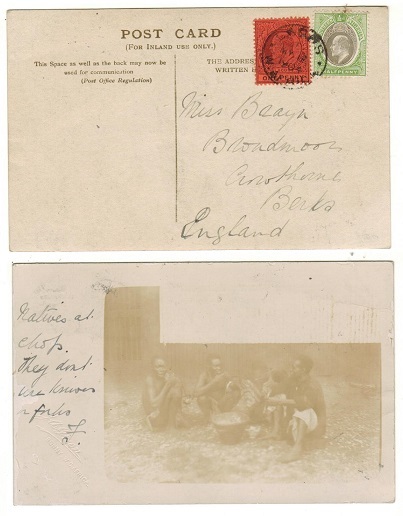 use of picture postcard addressed to UK depicting a real photo of natives eating bearing Lagos 1d adhesive tied in combination with Southern Nigeria 1/2d by LAGOS/W.AFRICA cds. 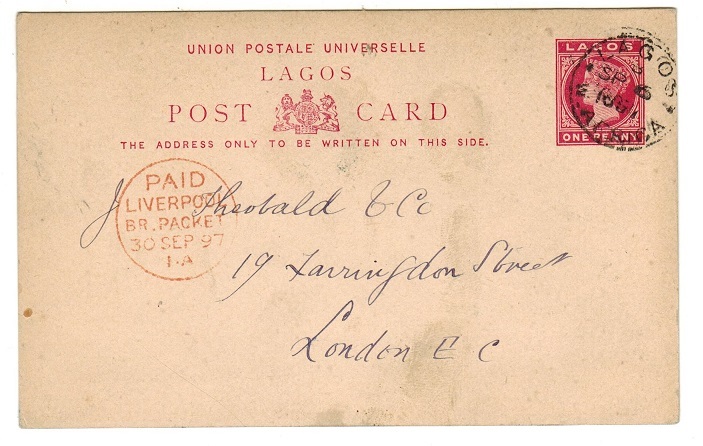 LAGOS - 1901 3d rate cover to UK. 1901 (FE.25.) registered cover addressed to UK (minor faults and a little grubby) bearing 1d and 2d adhesives tied by barred duplex cancels with LAGOS/W.AFRICA transit b/s. LAGOS - 1902 3d rate registered cover to UK used at LAGOS. 1902 (FE.16.) 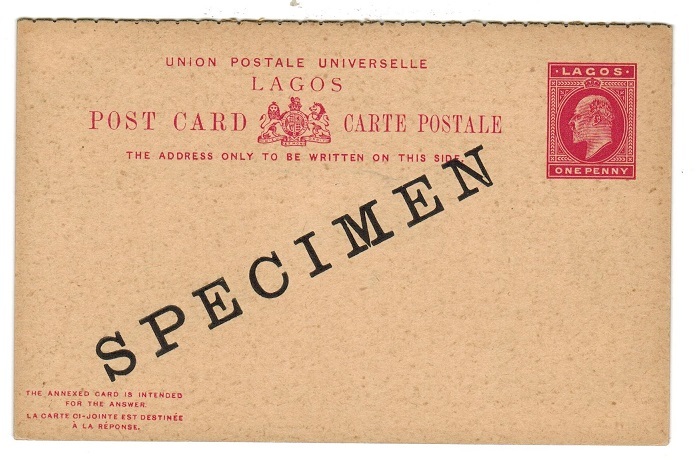 registered cover addressed to UK bearing 1d and 2d adhesives tied by LAGOS/ W.AFRICA cds. LAGOS - 1905 inward picture postcard from UK. 1905 (OC.9.) 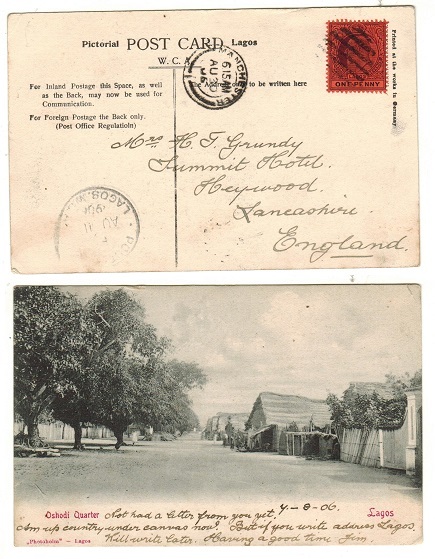 inward picture postcard from UK cancelled POST OFFICE/LAGOS W.C.A. on arrival. LAGOS - 1905 inward picture postcard from France. 1905 (FE.28.) inward picture postcard from France cancelled POST OFFICE/LAGOS W.C.A. on arrival. LAGOS - 1901 1d rate postcard use to Germany. 1901 (AP.6.) 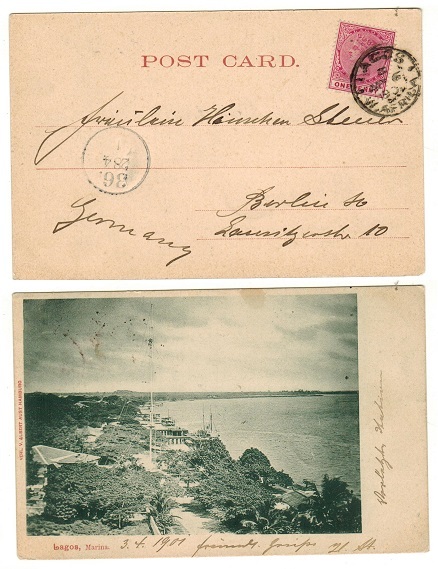 use of postcard addressed to Germany depicting 'Lagos Marina' bearing QV 1d (SG 22) tied LAGOS/W.AFRICA. LAGOS - 1901 1d rate postcard use to Belgium. 1901 (JA.14.) 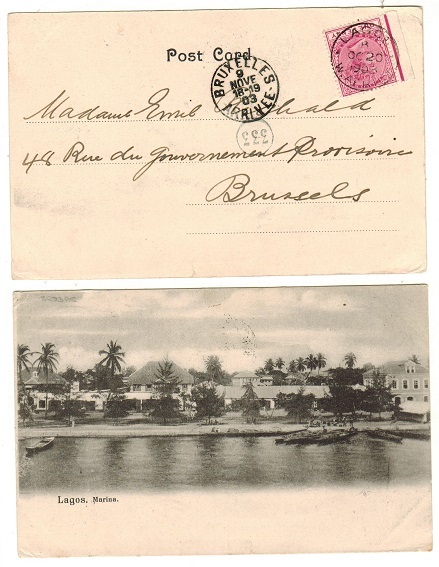 use of postcard addressed to Belgium depicting 'Lagos Marina' bearing QV 1d (SG 22) tied LAGOS/W.AFRICA cds. LAGOS - 1902 1d rate postcard use to Germany. 1902 (NO.10.) 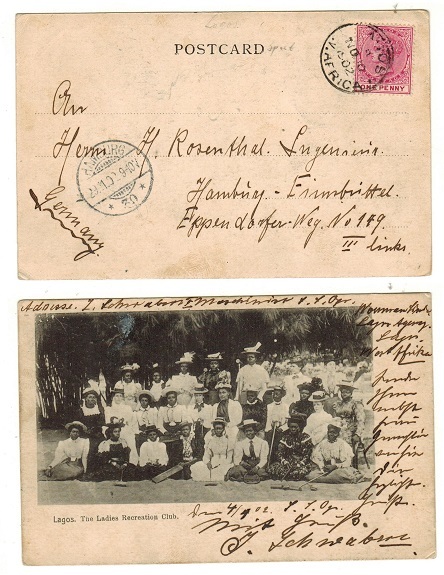 postcard use addressed to Germany depicting 'Lagos-The Ladies Recreation Club' bearing 1d (SG 22) adhesive tied LAGOS/W.AFRICA cds. LAGOS - 1903 1d rate postcard use to Belgium. 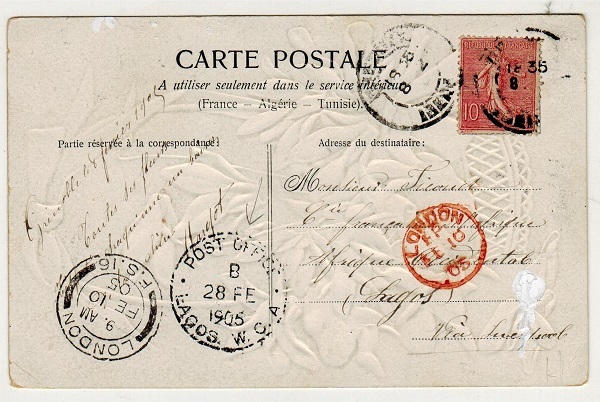 1903 postcard use addressed to Belgium depicting 'Lagos' bearing 1d (SG 22) tied by part LAGOS cds. 1903 (OC.20.) 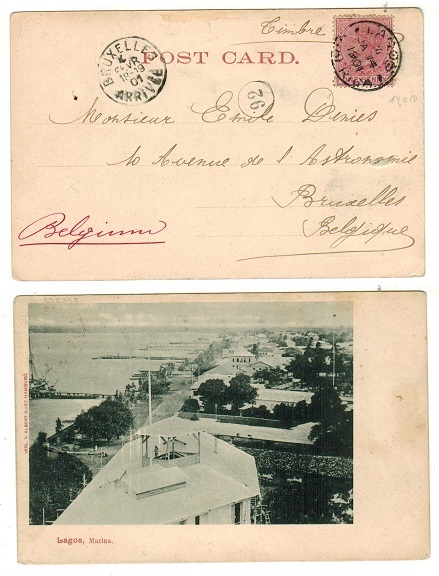 postcard use to Belgium depicting 'Lagos Marina' bearing 1d (SG 22) tied by LAGOS/W.AFRICA cds. 1903 (OC.20.) 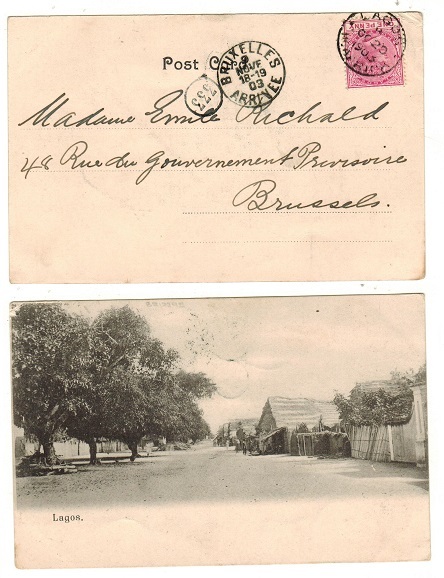 postcard use addressed to Belgium depicting 'Lagos' bearing 1d (SG 22) tied by LAGOS/W.AFRICA cds. LAGOS - 1905 1d rate postcard use to UK. 1905 (OC.28.) 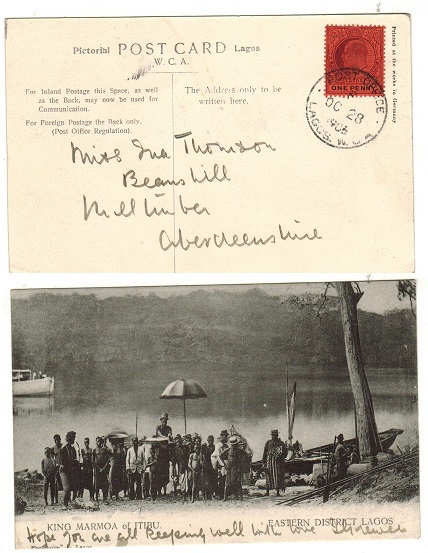 postcard use to UK depicting 'King Marmoa of Itibu-Eastern District Lagos' bearing 1d (SG 55) tied by POST OFFICE/LAGOS WCA cds. 1905 (JU.26.) 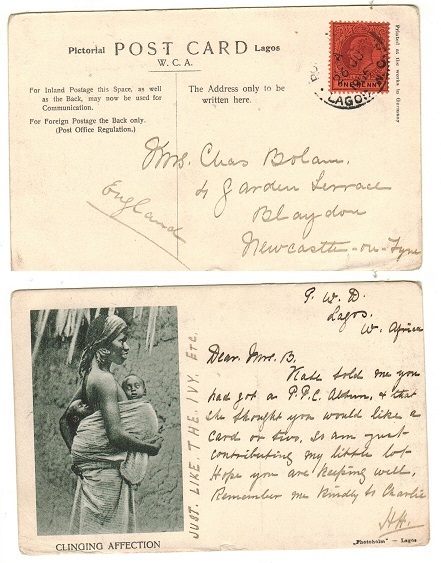 postcard use to UK depicting 'Clinging Affection' (mother and children) bearing 1d (SG 55) tied by POST OFFICE/LAGOS WCA cds. 1905 (OC.7.) 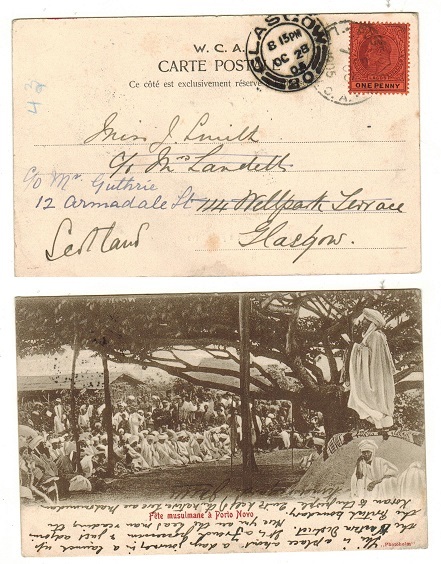 postcard use to UK depicting 'Fete Musulmane a Porto Novo' bearing 1d (SG 55) tied by POST OFFICE/LAGOS WCA cds. LAGOS - 1905 1d rate postcard use to India. 1905 (MR.13.) postcard use (month inverted) addressed to India (unusual) depicting 'Lagos' and bearing 1d (SG 55) tied by POST OFFICE/LAGOS WCA cds. LAGOS - 1907 1d rate postcard use to UK. 1907 (JA.12.) 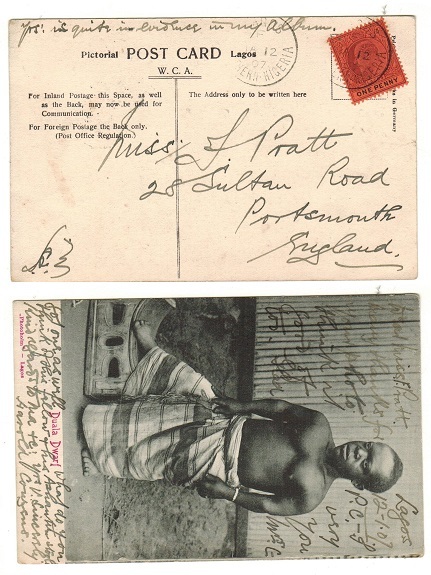 postcard use to UK depicting 'Duala Dwarf' bearing 1d (SG 55) tied by LAGOS/ SOUTHERN NIGERIA cds. 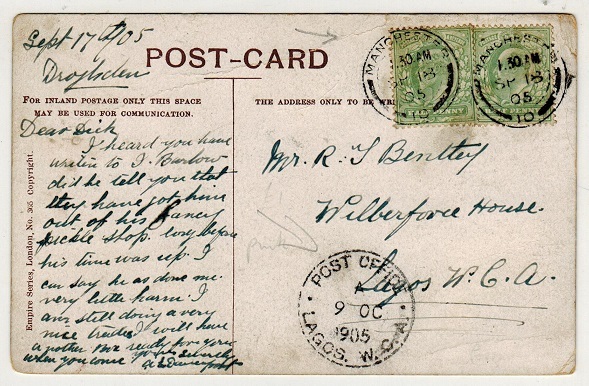 LAGOS - 1908 1d rate postcard use to UK. 1908 (AU.11.) postcard use to UK depicting 'Oshodi Quarter-Lagos' bearing 1d (SG 55) tied by grilled duplex with POST OFFICE/LAGOS WCA cds at lower left. LAGOS - 1904 2 1/2d rate cover to USA used at ABEOKUTA. 1904 (SP.30.) cover addressed to USA bearing 2 1/2d adhesive tied by light ABEOKUTA/W.AFRICA cds. LAGOS - 1893 1d PSC to UK cancelled LAGOS/W.AFRICA. H&G 7. 1893 1d carmine on cream postal stationery p'card to UK cancelled by LAGOS/W.AFRICA cds dated SP.6.97 with red PAID/LIVERPOOL/BR.PACKET transit cds at left. H&G 7. 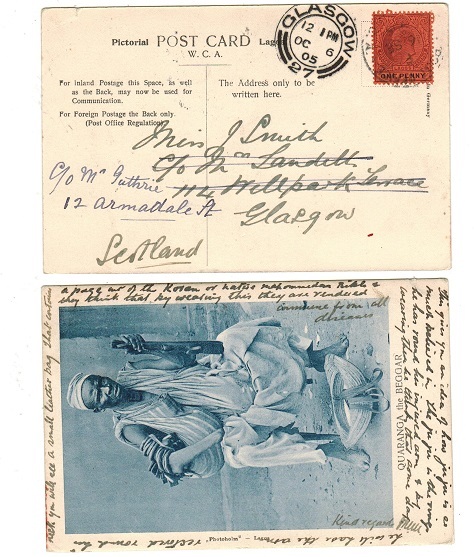 1905 (SE.16) use of picture postcard to UK depicting 'Quaranga the beggar' & bearing 1d adhesive tied by POST OFFICE LAGOS W.C.A. cds. LAGOS - 1895 2 1/2d rate cover to Germany. 1895 (JA.15.) 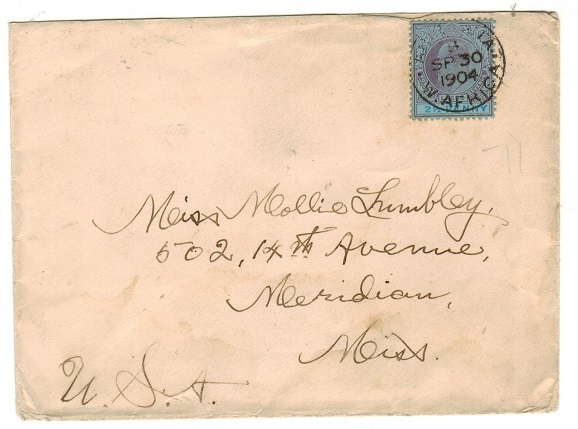 cover addressed to Germany bearing 2 1/2d ultramarine adhesive (SG 31) tied by barred duplex with LAGOS/W.AFRICA b/s. Red PAID/LIVERPOOL/BR.PACKET strike at lower left and HAMBURG arrival b/s. LAGOS - 1905 1d rate cover to UK with Paquebot usage. 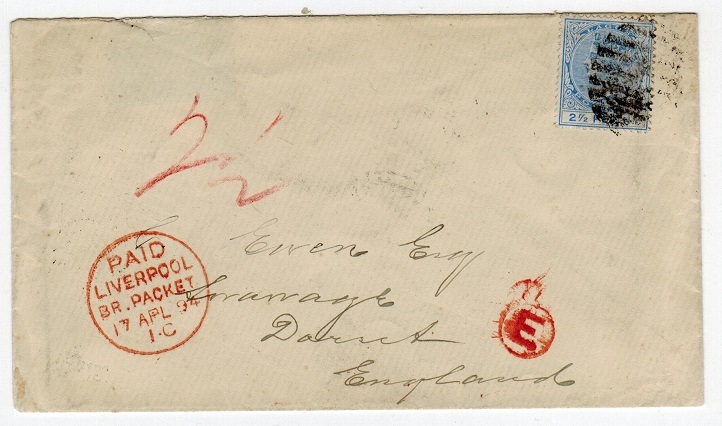 1905 (DE.7) cover to UK bearing 1d (SG 55) tied by PAQUEBOT/PLYMOUTH cds. LAGOS - 1887 2/6d green and carmine mint. SG 39. 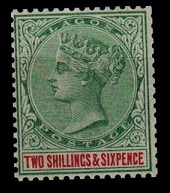 1887-1902 2/6d green and carmine in fine mint condition. SG 39. LAGOS - 1902 1d+1d PSRC unused overprinted SPECIMEN. H&G 10. 1902 1d+1d car5mine on buff postal stationery reply postcard in unused condition with diagonal SPECIMEN overprint. H&G 10. 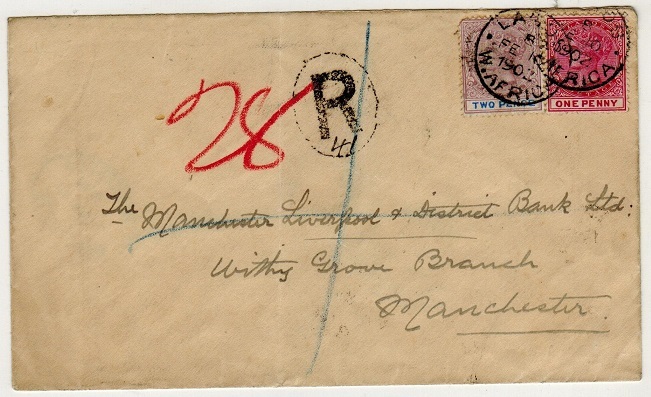 LAGOS - 1894 cover to UK bearing 2 1/2d (SG 31) tied LAGOS/W.AFRICA. 1894 (MR.19.) 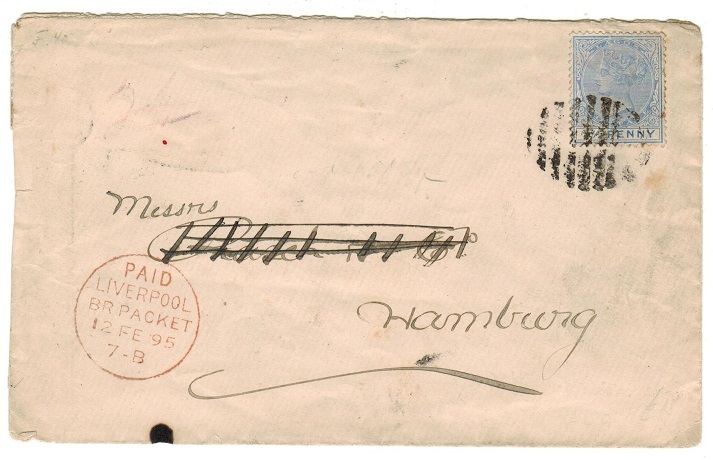 cover addressed to UK bearing 2 1/2d ultramarine adhesive (SG 31) tied by barred 'dumb' duplex with LAGOS/W.AFRICA b/s and red PAID/LIVERPOOL/BR.PACKET transit cancel on front. 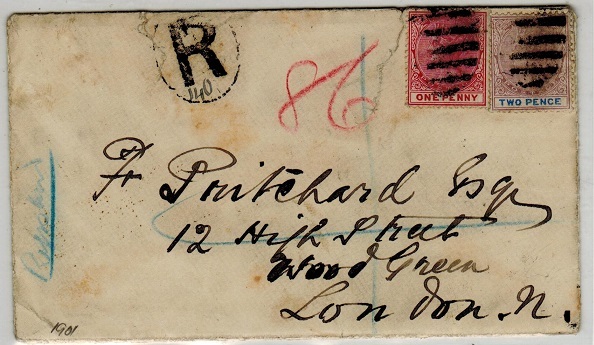 Rated '2 1/2d' in red manuscript and with circular 'E' postmans h/s applied in UK. LAGOS - 1902 cover to USA with 1d (x3) adhesives (SG 22) tied LAGOS/W.AFRICA. 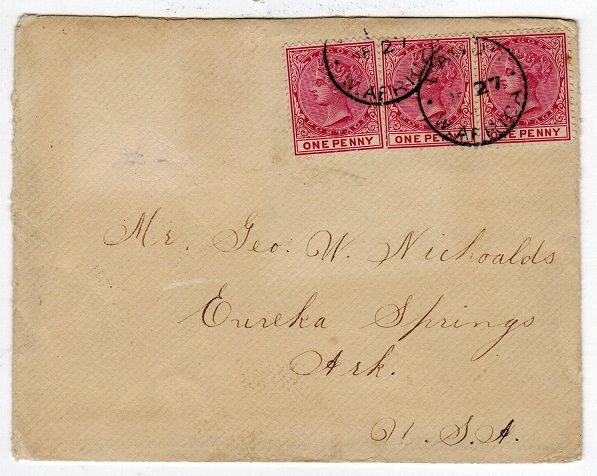 1902 (AP.27) cover to USA bearing QV 1d rose carmine strip of three (SG 22) tied by LAGOS/ W.AFRICA cds. 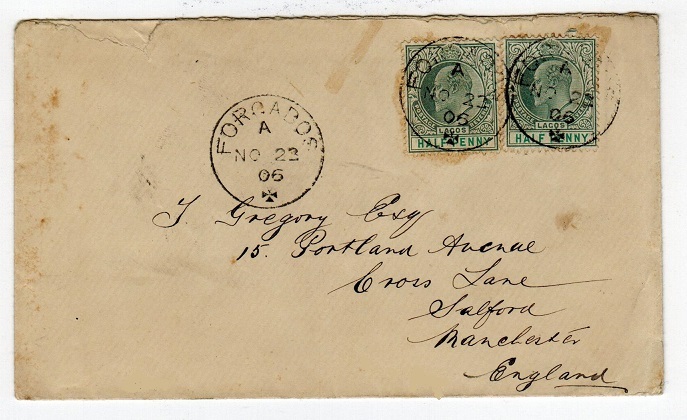 LAGOS - 1906 cover to UK from FORCADOS. 1906 (NO.23.) 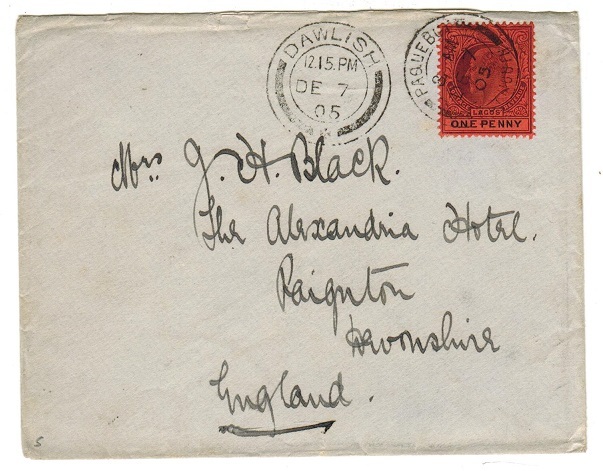 cover addressed to UK bearing Edward VII 1/2d adhesives (x2) tied by s/r FORCADOS cds with code 'A' slug and celtic cross at bottom.